“I hear you’ve got my cow,” was the first thing the man said. Heart sinking, Hannah described Davey to him. “Yep, sounds like one of my bulls.” We had all fallen in love with Davey and were terrified the farmer would want him back. 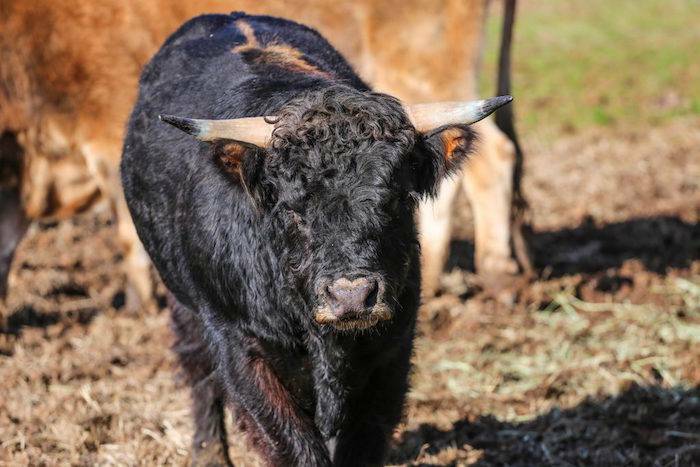 This is Davey, and he is perhaps the luckiest bull around. After two years living at the farm next door, Davey decided it was time to integrate into a new family. He broke a fence down and meandered over to our male bovine herd. By morning, he had fully integrated himself. 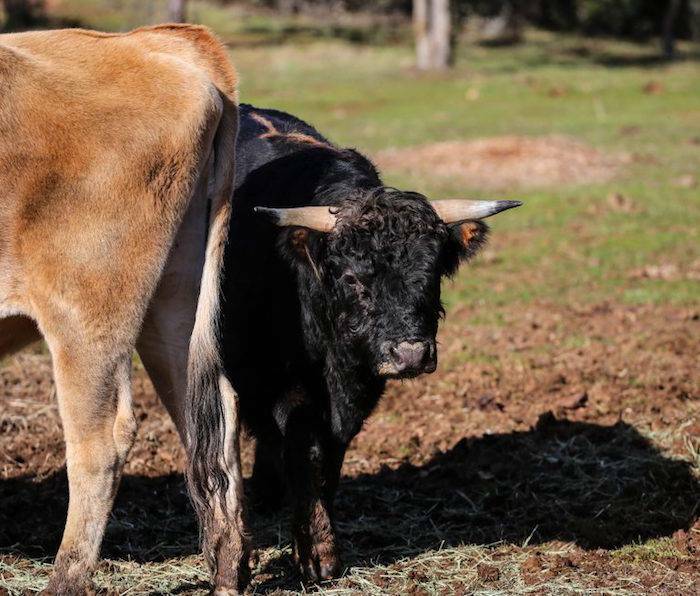 When animal care director Hannah Beins went out to feed the herd, she was surprised to find a small, hairy, black bull gazing casually back at her. When you find a lost dog or cat, you check for tags, a microchip, post on social media, put up flyers, and as a last resort, transport them to the local animal shelter. A 1,000-lb bull needs to be handled differently! Farmers do not microchip and (luckily) Davey had never been cruelly branded with a hot iron. The penalties for not attempting to find Davey’s “owner” were too high – possible revenge from the rancher, criminal charges filed for theft…we had to try and find the farmer so we could negotiate Davey’s release to us. We called neighbors, posted flyers on neighboring gates, and notified the local shelter. After a month of fruitless searching, we received a tip that a property bordering our land had cows. Accessing the property meant driving four miles away…exactly what Hannah did. A neighbor directed her to a locked gate…and soon after a truck raced down the driveway to meet Hannah. We had all fallen in love with Davey and were terrified the farmer would want him back. The man had a herd of 17 cows, calves, and bulls and planned on sending all to slaughter the following morning. Time was of the essence. Hannah explained how well Davey integrated into our herd and asked if Animal Place could be Davey’s new home. She held her breath and waited…until he finally said yes! Phew! Davey, now neutered, is one lucky bovine. He will live out the remainder of his life safe and sound at our sanctuary. That is not the case for the remainder of his family, who we were unable to save. If you are moved by Davey’s escape from slaughter, consider that no cow wants to die. You can help cows like Davey by adopting a vegan lifestyle and donating toward Davey’s care! Go to our website to donate.